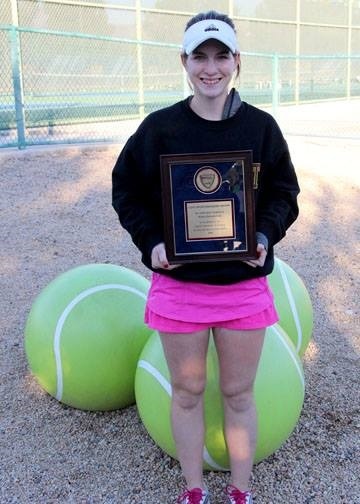 The USTA Winter Nationals, one of the top four events on the national calendar each year, was held Dec. 27-January 2 in both Phoenix(Boys/Girls 16s & 18s) and Tucson (Boys/Girls 12s and 14s). Vallabhaneni, of Paradise Valley, Ariz., was the fourth seed coming into the event in Tucson, and didn't drop even a set along the way in seven matches, including two 6-0, 6-0 victories in the first two rounds. Vallabhaneni dispatched top-seeded Aidan Mayo in the semifinals, then smoked 15-seed Jameson Corsillo in the final 6-1, 6-4, to earn his first-ever national championship gold ball. In Phoenix, Savannah Slaysman (left) and Allie Sanford (both of Phoenix) finished in third place in Girls' 18s doubles, while Delaney Nothaft (Tempe, Ariz.) and partner Samantha Martinelli (Denver, Colo.) finished in fourth place in Girls' 16s doubles. Slaysman also brought home the Sportsmanship Award in the Girls 18s along with Frederick Wentling (Phoenix) in the Boys 14s. USTA Central Arizona would like to congratulate all of the following participants for making it to the USTA Winter Nationals.